The TRAVELCUBE is designed for convenient portable and economical surge protection. Small and powerful, the TRAVELCUBE features 1080 joules. Throw it in a briefcase or purse and have quality surge protection wherever you need it - hotel room, dorm, client office - anywhere! 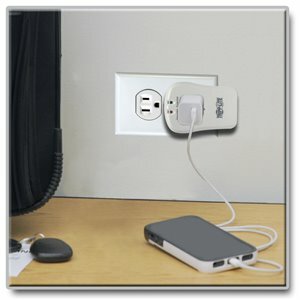 Small enough to fit into a pants pocket, the compact TRAVELCUBE converts any standard wall outlet into a surge protector—just plug it in and connect your equipment! It provides powerful AC line surge protection to one standard AC outlet and dataline surge protection to a set of RJ11 telephone jacks. The TRAVELCUBE is a cost-effective surge protection solution for laptops, electronic notepads, personal organizers and other portable electronic devices. The TRAVELCUBE provides 1080 joules of surge suppression to prevent surges from damaging your valuable electronics. Includes full normal mode (H-N) and common mode (N-G/H-G) line surge suppression. Various electromagnetic and radio sources can cause disruptive interference on the AC line. Known as EMI (electromagnetic interference) and RFI (radio frequency interference), this line noise is a common cause of performance problems and can also lead to incremental hardware damage and data corruption. The TRAVELCUBE incorporates technology that filters out disruptive line noise for peak performance of your components. Two diagnostic LEDs (GROUNDED and PROTECTED) show power and protection status, enabling you to recognize power problems before they affect your valuable equipment. The red GROUNDED LED verifies that the TRAVELCUBE is connected to a properly grounded wall outlet. The green PROTECTED LED indicates that surge protection is available. If the PROTECTED LED ever goes out, simply return the TRAVELCUBE to Tripp Lite for a free replacement. A phone connection represents a potential back door through which a damaging surge can reach your equipment. The TRAVELCUBE includes one set of built-in tel/DSL (RJ11) jacks to prevent surges from damaging your modem/fax/phone equipment (6-ft. phone cord included). For peace of mind, the TRAVELCUBE comes backed by a lifetime warranty and $10,000 Ultimate Lifetime Insurance (USA, Canada and Puerto Rico only) for any connected components damaged by a power surge. The TRAVELCUBE is also manufactured in compliance with strict RoHS specifications, reflecting Tripp Lite’s commitment to environmental responsibility.